Tennis elbow, or lateral epicondylitis, is a common form of forearm tendonitis that affects many people, most of whom are not tennis players. Lateral epicondylitis is treated by Dr. Peter G. Fitzgibbons, MD at The Centers for Advanced Orthopaedics: Maryland Orthopedic Specialists Division. Dr. Fitzgibbons performed fellowship-training in hand, wrist, and elbow surgery through the Harvard Hand & Upper Extremity Fellowship based at Brigham & Women’s Hospital in Boston. 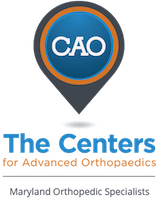 With locations in both Germantown and Bethesda, Maryland, he and a team of orthopaedists, hand therapists, and physical therapists offer a comprehensive range of services covering the diagnosis and treatment of lateral epicondylitis. What exactly is lateral epicondylitis? The lateral epicondyle is a spot on the outside of the elbow where the tendons that straighten the wrist and fingers attach. Any tendon needs a good blood supply to stay healthy, and it’s thought that because the blood supply to that tendon attachment isn’t very good, it’s prone to developing small chronic tearing over time even from normal use. For more information see: http://www.assh.org/handcare/hand-arm-conditions/tennis-elbow. What is the natural history of lateral epicondylitis? In the long run, lateral epicondylitis seems to go away in just about everyone, but it can take a long time – sometimes months. There is nothing bad happening to the tendon in the meantime – lateral epicondylitis does not lead to significant tearing that impacts function or strength in the arm. There are many treatments for lateral epicondylitis. Usually, we start with a set of specific physical exercises that have been shown to help in many patients. A wrist brace or band on the forearm can also be helpful. Injections of cortisone or platelet-rich plasma have been shown to provide relief in some patients, though in rigorous studies the effect is a little more unclear. All of these are options that we consider. In cases where symptoms persist for greater than 6 months or so, an MRI is obtained and a small number of patients benefit at that point from surgery. Surgery for lateral epicondylitis is performed as an outpatient procedure and is usually done with general anesthesia. During the surgery the degenerative tendon tissue is removed and tendon defect repaired. Dr. Fitzgibbons performs most of these procedures at the Massachusetts Avenue Surgery Center, an outpatient surgery center that provides a safe, patient-oriented experience in a friendly and comfortable environment.